If you love bad-for-you food and great sneakers, then these Vans are about to make your day. 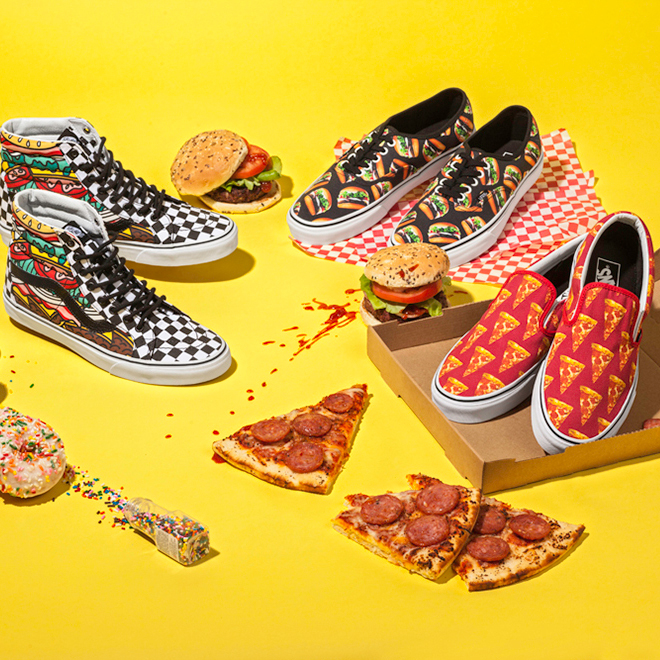 The new Vans Late Night Pack, a collection of sneakers printed with bold patterns of all your favorite junk food and fast food; if it's greasy and delicious, these Vans are covered in it. From bold hamburger comic-style illustrations on classic checked slip-ons to French fry decorated, bright blue, low top lace-ups, to pink taco socks you'll be tempted to wear everyday, the Late Night Pack has just about everything you could want. If you fancy yourself too sophisticated for fast food, no worries: Vans still has you covered. The collection features macaron-printed sneakers, hats, and backpacks, so you can sport your skating gear the classy way. As if the macarons, donuts, and cupcakes weren't sweet enough, these sneakers get almost too cute to handle when you look at the children's shoes. After all, what's cuter than a toddler in burger-printed mid-tops or a second grader in donut slip-ons? If you want to rock some new food shoes you better hurry—some items have already sold out. You can buy from the Vans Late Night Pack at Vans.com or your local retailer. And if you can’t pick up a pair yet you can always drown your sorrows with actual pizza and burgers.